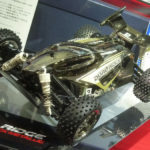 Popular 4WD racing buggies and dual ridge special specifications appear in the Futuristic Form. A body composed of smooth surfaces and a large rear wing with an edge are cut finished black plated finish. Simply sticking a special sticker that matches the body color completes the body full of shining. 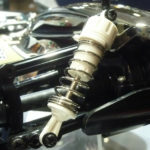 In addition, we combine semi-glossy chrome-plated wheels and tighten our feet. ★ Length 380 mm. 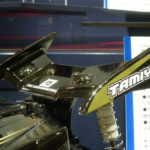 ★ The chassis is the shaft drive 4WD TT – 02B. ★ Suspension equipped with white-collar CVA damper, double wishbone 4-wheel independent with long arm specification.